The wait is over, London based dirt-pop trio Critics' second EP is here. 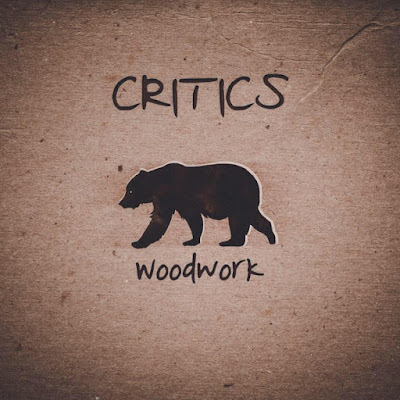 Filled with the catchy melodies, insane guitar parts and groove heard in their previous EP 'Spilt Milk', the highly anticipated 'Woodwork' reinforces Critics' label of 'ones to watch'. Kicking off with previously teased track 'Key Lime Pie' gets the EP off to a great start. Reminiscent of the more pop infused elements of the first EP, this is the type of song you can't help but click and sway along to. Continuous dance beats and uplifting guitars are punctuated by those distant vocals that have come to define the Critics sound. This adds interest to the verses. Vocalist Lynn's unique tone can be heard throughout the chorus, adding a bit of grit to an otherwise very pop orientated track. In contrast, the more rock orientated 'What Are You Waiting For' follows. The crash of cymbals, claps, heavy bass drum and distorted guitars lets you know we're in a different area of the Critics brand now. This is a much darker toned track yet it retains the ability to make you want to move around - even if it's to sway your arms and stamp your feet. I particularly liked the call and response element of 'What Are You Waiting For' that features group vocals shouting the hook of the song in response to the drum pattern. You can definitely imagine this live. Next up is 'Soldier In The Sky', a slightly quieter track. Interestingly, this is the only song on the EP to start with a solitary piano, making for a prettier, more emotional sound. Although pop ballads aren't what you'd typically associate with Critics, they've done this very well. Having a piano based track allows you to focus on the raw emotion of the lyrics to capture a deeper meaning within this song. Keeping the piano vibe up, 'Throw It Away' appears next. 'This is the war that can't be won. I particularly liked the layered vocals distantly, almost whispering, 'what do you think of me' - adding another dimension to the song. Although I wasn't fully convinced at first by the drop into dance techno-like rhythms during the chorus, I must admit that they grow on you quite quickly until you can't help but do some crazy armography at the desk! Bringing a more acoustic vibe to the table is final track 'If I Had It My Way'. A simple beat and acoustic guitar, coupled with the odd piano phrase allow Lynn's raw vocal to be showcased at the beginning of this track. Again, this is a track to sway and nod your head to, with an infectious groove that feels slightly slower than the high energy we're used to from Critics. Overall, a great second EP from London based band Critics, we look forward to hearing more. Find out more about Critics here.